Alouis Gerzelj first appears at Painesville, Lake County, Ohio, about 1935. 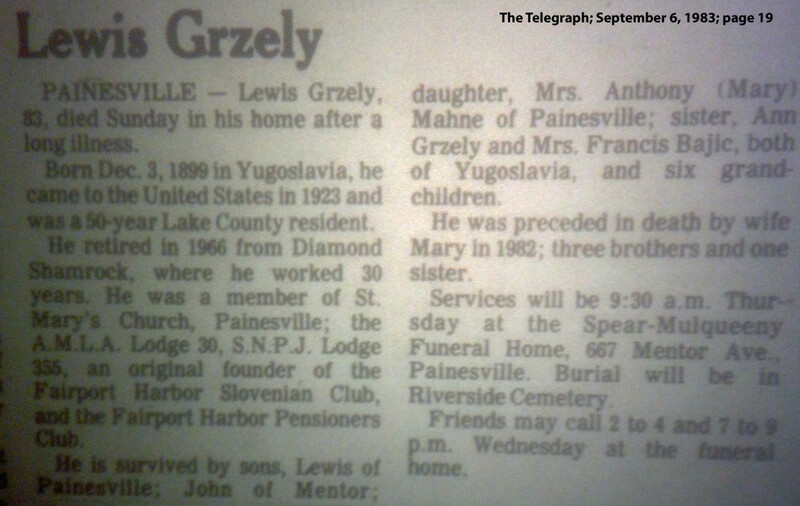 In America, Alouis Gerzelj was known Lewis Grzely. Alouis was born in the Austro-Hungarian Empire, near the Empire’s border with Italy. This territory came to belong to Italy in 1918, as a result of the World War One. After World War Two this territory became part of Yugoslavia. When Alouis Gerzelj immigrated to America the area belonged to Italy. Alouis Gerzelj was Slovenian. Alouis Gerzelj was born on Sunday, December 3, 1899, at Slovenia. Alouis was married to Mary Rote. Alouis died on September 4, 1983, at his home, Painesville, Ohio, at age 83. His body was interred at Riverside Cemetery at Painesville, Ohio. Mr. Grzely’s wife preceded him in death in 1982. Alouis Gerzelj immigrated to the United States on September 2, 1923, at age 23. He immigrated at the Port of Philadelphia, Pennsylvania. According to the 1940 Federal Census, Mr. Grzely was living at Johnsonberg, Elk County, Pennsylvania, on April 1, 1935. Alouis Gerzelj became a citizen of the United States in 1939. He resided at 841 North St. Clair Street, Painesville, Lake County, Ohio, when he was naturalized. Mr. Grzely retired from the Diamond Alkali Company in 1966 after 30 years of service. 1. Lewis Grzely was born about 1935 at Ohio. 3. Mary Grzely. Mary was married to Anthony Mahne.